As mentioned in the first in this series on children's literature dealing with grief, there is an abundance of material out there to recommend to families with children dealing with grief. In fact, it's often overwhelming with so many choices. Hopefully this random sample from my local library will, if nothing else, illustrate the wide variety of books out there. Often until you actually see inside the book yourself, it's hard to know which book is the right one. In fact, if you went on just book lists, the book I'm reviewing today is by far on more lists than any other books I'm reviewing, making me assume it is very popular. Yet without reading it, as you may see, I wouldn't have discovered it's unique style, different than Tear Soup, or even The Goodbye Boat reviewed in an earlier post. 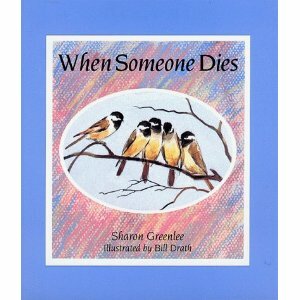 When Someone Dies is written by Sharon Greenlee and illustrated by Bill Drath. Published in 1992 by Peachtree publishers it is written for a reader aged 8-12. "If the person who died was very important to you, you get to worrying that all the other important people might leave too. I've never heard of it happening that way, but it's hard not to think about it"
"When people die, they can't come to your house anymore. You wonder what they'd look like now, and you do all you can to make a picture of them in your mind." Towards the second half the author begins to task the reader to actually do some things such as finding someone to cry with and writing a letter to the person who died. Besides normalizing grief with the second person speech, I noticed that the word "dies" is used 10 times out of a total of 15 pages of statements. I can't help but think even using the word is a way to normalize the experience. No metaphors in this book, death is definitely the main character. The illustrations use a washed out almost dull tone, adding to the mellow nature of the book. One thing I found interesting is that all of the scenes are out doors in nature and the people all Caucasian, which doesn't do much to normalize to a wide audience. I think for certain children, this type of writing style is what is needed. Due to this books popularity on many of the lists out there, it's definitely good to be familiar with it! Readers may find this resource from Hospice Foundation of America (HFA) helpful: "Using Books To Help Children and Adolescents Cope With Death: Guidelines and Bibliography"
Children's Books on Grief: What's Heaven?